MBAs Preeti Singh (left) and Matt Avery (right) from the C. T. Bauer College of Business at the University of Houston are semifinalists in the Capgemini Innovators Race with their team Bauer Power. 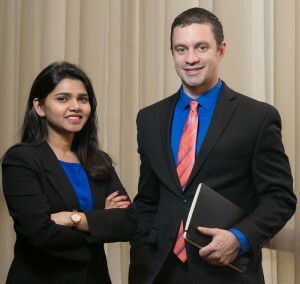 Bauer MBA students Preeti Singh and Matt Avery are representing the United States as one of six teams competing for $25,000 in Capgemini’s Innovators Race Competition, which uses online voting to determine the final winner. The team, named “Bauer Power,” are competing with a proposal to help the Boys & Girls Club of America (BCGA) attract future members and retain current members and to increase their public presence. Their plan includes involving well-known BCGA alumni, such as Jennifer Lopez and Kevin Durant, and bolstering the organization’s social media presence. In order to advance to the final round of competition and have a chance to present their plan to a Capgemini panel in Paris in April, the Bauer MBA team needs public votes. (View Bauer Power’s proposal and vote on Capgemini’s website here). The team’s proposal landed them in the top six semifinal round as the only U.S. team, besting dozens of teams from around the globe. The remaining teams were all profiled with webisodes published on CNN’s website. Avery, who has a background in working with nonprofits, was also excited to take on the case.